​Matilda of Tuscany, Imperial Vicar and Vice-Queen of Italy, 1046-1115, daughter of Margrave Boniface III of Tuscany, wife to Godfrey IV, Duke of Lower Lorraine and briefly to Welf V, no issue. Matilda became one of the most powerful rulers of the Italian Middle Ages controlling most of central and northern Italy. Her revolt against the feudal system laid the foundations for the Italian Renaissance and is one of the few medieval women remembered for her forty year military accomplishments known to have fought in armor at the head of her troops. She challenged the boundaries between military and gender, was a defender of the reforming papacy supporting them financially, militarily and diplomatically and stood with pope Gregory VII and the church against Henry IV, turning the tide of the first great war between Church and State known as the Synod of Worms, a controversy each claiming the right to appoint bishops and abbots within the Empire. Her father’s death in 1052 placed the extensive family lands under her step-father as women in accordance with Roman laws had no rights to own or manage property. Lands later passed to Matilda’s husband and then after his death in 1076 he willed her assets to his nephew Godfrey Bouillon. The nephew’s nomination by the church as a leader for the first Crusade in 1095 “was hardly happenstance” dying during the crusades and finally placing her as the undisputed heir of all her parents' allodial lands yet she spent the remainder of her life fighting to be formally invested by the Holy Roman Emperor as the Margraviate. ​In 1088, Matilda founded the first law school in Europe, reviving the study of Justinian’s code of Roman law giving women the right to own, manage and inherit property. She built or restored some of the most beautiful Italian Romanesque monuments in Florence, Lucca, Mantua, and Pisa and established a network of hospices throughout northern Italy that revived pilgrimage and trade, laying the foundation for the Italian Renaissance. She founded over one hundred churches, monasteries, and built or restored bridges between the Alps and Rome. At her request she was buried at the Abbey of San Benedetto di Polirone until 1634 when Pope Urban VIII had her remains reinterred in the Vatican in Rome with a memorial tomb prominently placed within one hundred yards of the apostle Peter, a place now considered the Honor and Glory of Italy and is the only person besides the popes depicted as holding the key to heaven. One hundred thirty-nine of her letters are extant with subjects ranging from charters, judgments, grants, and settling disputes. 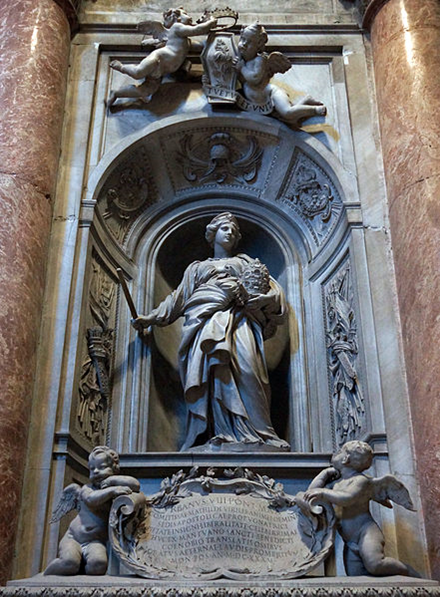 Originally buried in Abbey of San Bendetto, reinterred in the Vatican by Pope Urban VIII, one of only 3 women buried in the Basillica , Tomb of Countess Matilda of Tuscany, Gianlorenzo Bernini, St. Peter's Basilica, Vatican City © Bede735 CC BY-SA 3.0. Spike, Michele K. Tuscan Countess: the Life and Extraordinary Times of Matilda of Canossa. Vendome Press, 2005.